You can connect the wires however you like. For simplicity, and purely to experiment, just use some crocodile leads, you can find them at most electronic stores, but I just tend to get a lot off stuff from Ebay. 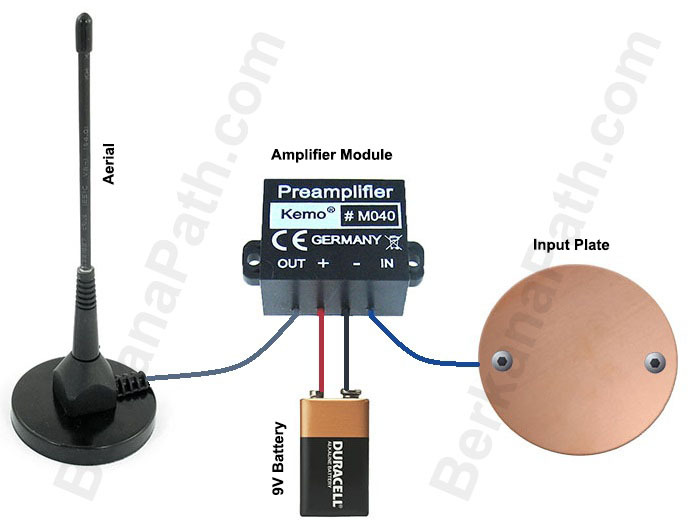 The wire from your input plate connects to the signal input of the pre-amp, the signal is then amplified, and passed to the aerial where it emanates into the aether to fulfil your intention or wish. You need to power the amplifier. Low power ones like this work okay with a 9v battery, you can get a clip on battery connector and connect the appropriate wires to the amplifier, then when you want to switch off the wishing machine, simply unplug the battery. There are some 9V battery holders that have inbuilt switches which would be ideal, again you can find these on Ebay, or places like Maplin, and RadioShack. The aerial can be anything conductive. The one in the image is a radio aerial, any length of wire will also work, you can experiment with different shapes, or patterns to see if it increases the power of your intention. That’s it, pretty straightforward. All the parts can be found online. The amplifier can be found here among other places. Have fun and experiment. Any questions, just send me an email. If you came here from (Pararesearcher.com – Chartered Engineer, Hypnotherapist, Spiritualist and generally confused! we did respond to Mr Connelly’s wholey mis-informed post, but he seems to have deleted all of our comments, and blocked the function to comment on the page. He was invited to respond to our questions and has clearly failed to do so.